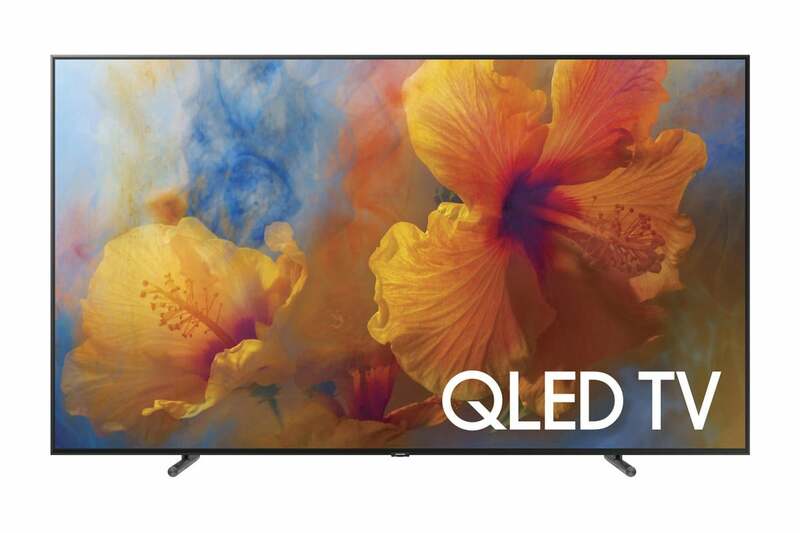 It’s tempting to call Samsung’s QN65Q9F the best 65-inch consumer TV on the market. It’s certainly the best LCD TV out there. But the competition is fierce: Sony’s OLED-based A1E is also a remarkable TV, and we just happened to have both sets in house this last week. With so much engineering excellence on display (pun intended), the comparison was fun. Making a choice, on the other hand, was difficult. The Samsung Q9F’s excellent overall design, greater brightness, truer color, and superb detail rendering will undoubtedly win it many, many fans. But so will the pure blacks and the resulting lush image of Sony’s A1E. 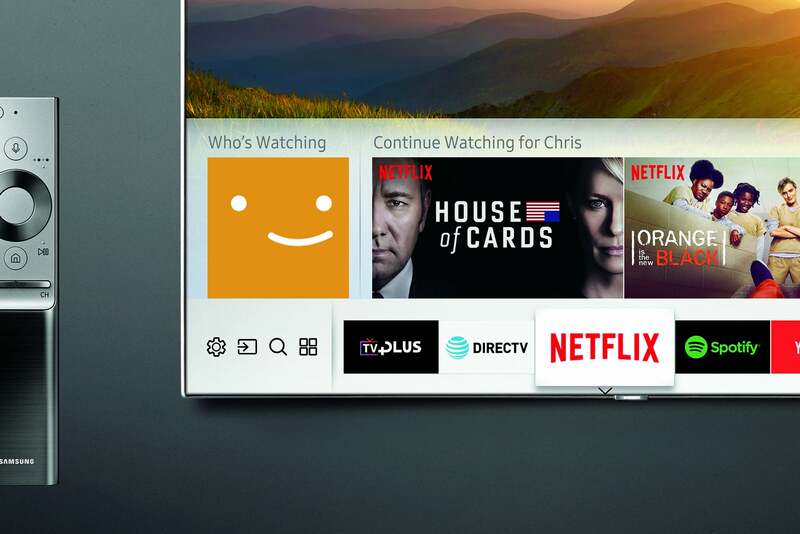 Regardless, if you have $5,500 to $6,000 to spend on a new TV, you need to consider both. Thanks to its OneConnect breakout box, which houses the ports and much of the electronics, the 64.5-inch (65-inch class) Q9F measures just one inch thick. The display panel has only the power connection and the fiber optical port for the OneConnect box, which can be routed through the stand as seen below. If you care about cable clutter, you won’t find a cleaner arrangement. Cable attachment is moved off the panel to the OneConnect breakout box. The new stands for the QLED series are wider and more stable than those that shipped with the SUHD series. As the Q9F is uniformly thin, without the bulge at the bottom that so many TVs have, there’s little to no gap when you mount it on the wall. If you do want to stand the Q9F on a table, Samsung has beefed up the the stand and made it 12.8 inches wide for a more stable base. The Q9F’s audio performance is quite nice for a TV that’s only an inch thick, although it’s not as clear as that of the Sony A1E. The ports on the OneConnect box include four HDMI 2.0a, one supporting ARC (audio return channel) to feed soundbars and the like; three USB ports; an ethernet port; and a digital optical output. Wi-Fi is 802.11ac, and there’s Bluetooth support as well. Until now, the LG Magic remote was our favorite TV remote control. 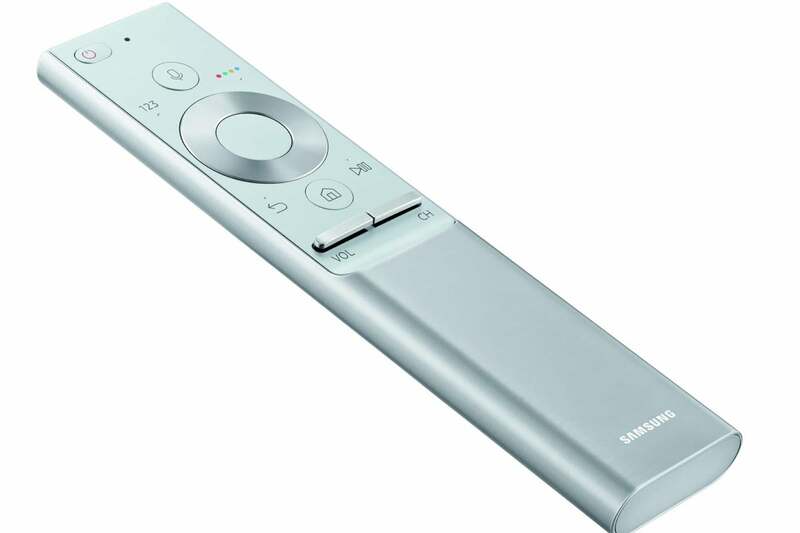 Samsung’s new OneRemote has supplanted it. It’s handsome, minimalist, and universal without user intervention. That is, when you attach a device to the Q9F and the TV recognizes it, the remote is automatically programmed to support it. Not only that, when the device is selected as the current input, the remote automatically switches modes to control it—a very cool, seamless experience that the Sony A1E's remote also has. Samsung's worked perfectly with our Xbox and several Ultra HD Blu-ray players. Okay, almost perfectly. 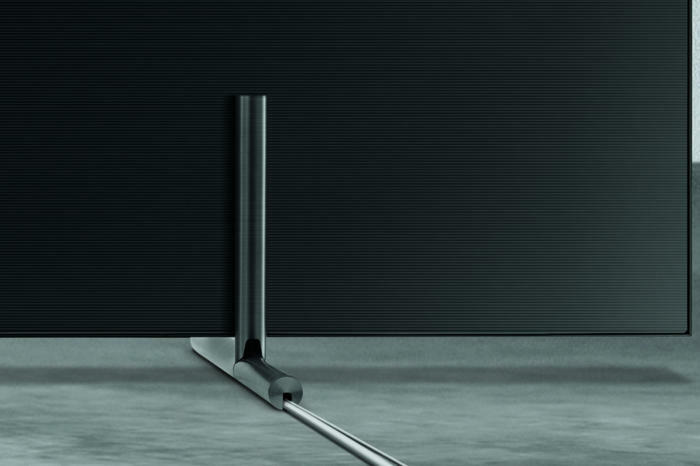 Samsung’s clever and minimalist OneRemote. Design awards should follow. There’s also a “transport” mode where the 4-function circular cursor control and center button function as the play/pause, FF, rewind, end, and begin controls. Nice, except for some reason the back button didn’t work with the menu structure of the Samsung UBD-K8500 Ultra HD Blu-ray player we test TVs with. Regardless, the transport mode ameliorates our major complaint about most minimalist remotes—the absence of dedicated transport functions. The on-screen interface is also top-notch, though we didn’t always appreciate scrolling all the way to the left to access settings. The last-used app is selected by default, and the Blu-ray app was invariably to the far right. But things are generally simple and intuitive, and you can change the order of the apps if you find that the one you use the most winds up far left. We’re niggling. The Q9F’s interface is a great improvement over last year’s SUHD interfaces. If real estate is all about location, location, location, then TVs are all about picture, picture, picture. And the Q9 is absolutely—picture, picture, picture. Color is rich, very accurate, and Samsung claims it matches 100 percent of the DCI-P3 color space. In easier terms, the Q9F reproduces way more colors more accurately than you’re used to if you haven’t rocked a quantum dot TV. Where LCD—and the Q9F in particular—rule is in reproduction of fine detail. Compared to the A1E and every consumer OLED we’ve seen, everything just seems a little sharper and with more definition. We miss this level of detail when we switch to an OLED. Motion and panning are buttery smooth (the hardware refresh rate is 120Hz) and the detail with HDR (high dynamic range) content is stunning. There’s also HDR+, which is SDR (standard dynamic range; i.e., all other video) to HDR up-sampling to let other material take advantage of the Q9F’s wide color space and greater brightness. The picture is as good as it gets in an LCD TV, and quite probably, TVs in general. The Samsung website’s claim of stunning blacks, however, is a bit awkward. The Q9F’s blacks are indeed excellent compared to other LCD TVs, but they’re as stunning as the A1E’s or other OLEDs. The Q9F’s backlighting defects were minimal—no blocking that we could see—but we did detect some mild but noticeable blooming with bright logos and objects on a dark background. Then again, those situations occur so infrequently in real-world video that we’d feel minor remorse for mentioning them if Samsung didn’t use such hyperbole in describing the Q9F's abilities in this area. As to overall brightness, the Q9F beat the A1E handily. We measured almost 700 nits of brightness with SDR material. That's what the Sony produces with HDR. White HDR images on the Q9F measured slightly more than 1000 nits. This TV has great HDR chops, and all the HDR-10 titles we threw at it looked great, including all the major vendor demos. To boil that all down, the Q9F has a fantastic picture, with a sharpness of detail that an OLED can’t match. On the other hand…. Where’s the Dolby Vision support? Prior to CES 2017, we might not have asked that question: But with 9 of the 10 major vendors and seemingly all of Hollywood now on board, Samsung seems to be swimming against the tide. Dolby Vision allows TVs to adjust themselves on a scene-by-scene—or even a frame-by-frame basis—where HDR-10 is a one-time deal at the beginning of the movie. Dolby’s dynamic changes can help greatly in bringing out the detail in very light or very dark areas of the picture. This type of dynamic metadata is also on the road map for the non-proprietary HDR that Samsung uses, but when and whether it will be supported we don’t yet know. Though lacking the pure blacks of OLED, the Q9F’s image is brighter and more detailed. It’s a rockin’ TV. Dolby Vision is supposed to be showing up in force in June 2017. Samsung’s firmware can be updated, and its TVs certainly have the chops to render Dolby Vision. But the company was fuzzy in its response to my queries as to whether the current SUHDs and/or QLEDs can or will ever be upgraded to support it. The Q9F is one awesome TV, nosing out Sony’s A1E by perhaps half a length at the wire as the better of the two. The Q9F offers better picture detail and truer color, flat-against-the-wall mounting, a better remote control, and a superior user interface. Sony's A1E offers the true blacks and velvety experience of OLED, but we miss seeing fine detail when its viewed side by side with Samsung’s Q9F. Still, the Q9F’s lack of Dolby Vision is somewhat disturbing. Six large is a lot of dough for a product that is incompatible with the HDR standard that might soon dominate the market. Then again, Dolby Vision might not rule; and if that comes to be, you’ll be fine with Samsung's Q9F. HDR-10 looks pretty good. But you might want to wait a month or two to see how this whole HDR standards thing works out. 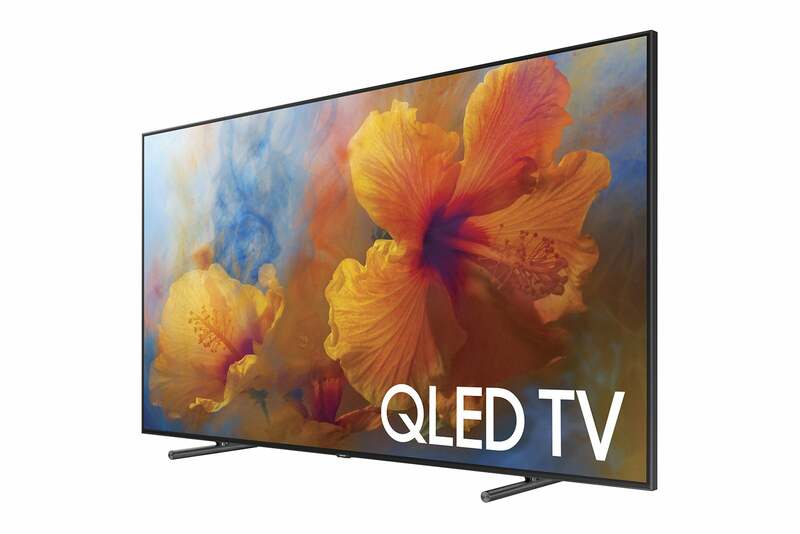 A final shopping tip: While Samsung's new QLED-series TVs are an overall improvement over its SUHD series, the image quality is only marginally better; and only then when lots of black is involved. If this TV isn't the best you can buy, it's darn close to it. The color, HDR, detail rendering, smooth motion, and 1000-nit brightness are all as good as it gets. Blacks are excellent for an LCD. The Q9F doesn't support Dolby Vision, though, and that HDR standard is rapidly gaining traction throughout the industry. Mild blooming with bright objects on large dark backgrounds.